Guy BurgoyneZhejiang Geely Holding Group Co.
WUHAN, China -- Not long ago, the oft-awkward styling of China's domestic brands was the laughing-stock of auto shows. Homegrown carmakers struggled with young designers who may not have even had driver's licenses. Or they farmed out work to overseas studios. The result was often a hodgepodge of clashing looks. Now, Chinese brands are changing tack and bringing experienced foreign talent in-house to mentor their fledgling programs. "China cars, not so long ago, were a joke. And they're not anymore," said James Hope, who was hired as design chief nearly three years ago to inject global flair at Chery Automobile Co. "Chinese companies have made massive improvements." Local rival Zhejiang Geely Holding Group Co. did the same. It named styling veteran Peter Horbury to head its global design team in 2011 and last year tapped Guy Burgoyne from General Motors to head the company's Shanghai studio. "Two years ago, Geely didn't really have an organized design department. It bought design, almost like a commodity," Burgoyne said. Now, he added, "we try to hire our own talent." Geely has 100 people at its main design center in Shanghai; 18 are foreigners, including Burgoyne, who is British. Chery's studio has five foreigners; 95 percent are Chinese. The numbers may not be much compared with powerhouse global carmakers, where half the designers may come from outside the company's home country. But for a domestic Chinese brand, such international infusion is off the chart -- and sorely needed. As Chinese carmakers such as Chery and Geely target overseas markets, they need styling that can compete on the global stage. Chery, for example, sells cars in some 60 countries. Yet Hope and Burgoyne, both speaking at the Global Automotive Forum here last month, said there are still some big challenges. "There is an incredible amount of talent in China," Hope said. "What I struggle with personally is experience," he said. "To take that beautiful sketch to a finished production vehicle, that's where the experience comes into play. You need to know engineering better than the engineers, because they will tell you, 'You can't do it.' And you have to tell them they can." Other cultural obstacles remain, including the Chinese tendency to defer to elders and avoid confrontation. Subverting your own creativity to groupthink can be a dead end for design, where proposing wacky ideas and defending your ideals are key. "International people are more open to challenging things," Burgoyne said. "The Chinese don't want others to lose face." The overhaul already has delivered more polished and refined cars. 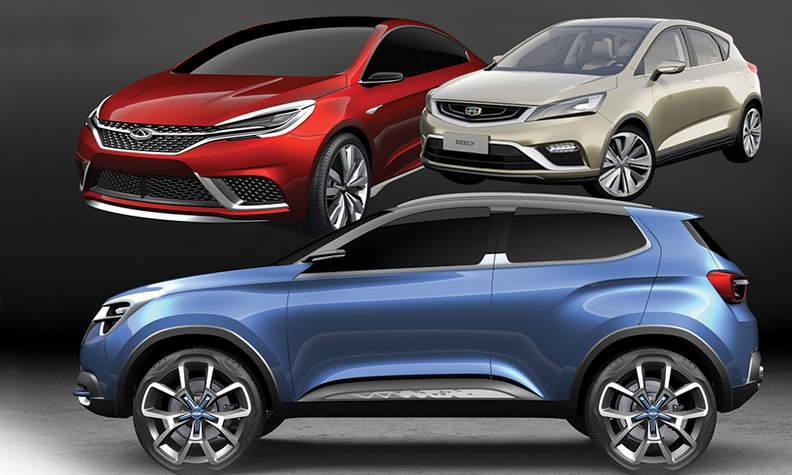 At this year's Beijing auto show, Chery debuted its new design direction in the Concept Alpha sedan and Concept Beta compact crossover. At the same time, Geely showed the Emgrand Cross, the second concept created at its Shanghai studio. Creativity, however, doesn't just flow one way into China. Foreign designers here hope to export some China-born ideas, too. Geely, for example, is working on a new cabin air purifier it thinks will be a hit with Chinese drivers disgusted by the clouds of smog clogging their big cities. But Burgoyne says drivers elsewhere should like it as well. He is integrating it into the cabin as a design feature that can set Geely apart. "An air cleaner in the car is something we talk about," he said. "It's a nice thought that you can take a long journey and when you get out at the other end, you actually feel better."